SO dear readers. I’ve decided to *try* (try is the operative word here) to pay homage to the awesome movie that is Mean Girls by starting up a regular post on Wednesdays that features pink in some way. Starting this week with this post and boy howdy have I ever picked a good one for ya’ll to start off with. Now, I pretty much adore Dollish Polish. I have several and I just love them all. I’ve had my eye on this baby for awhile because it is all kinds of pink and girly and therefore right up my alley! Oh yes oh yes oh yes. It’s So Fluffy, I’m Gonna Die is the most AMAZING pink crelly glitter bomb polish! Swimming in the luscious soft pink crelly base are a plethora (like the big words?) of various glitters in all shapes and sizes and finishes. Most importantly they are in all shades of pink! I see matte neon pink hexes, small metallic pink dots, small metallic raspberry dots, big holographic pale pink hexes, small satin pale pink squares and more! For a crelly glitter bomb, oh this reminds me I want to make this a thing! I think that we should call all crelly based glitter polishes…are you ready for my awesome idea?…CRITTERS! So for a CRITTER bomb (see how awesome is that?) the formula on this was dreamy. I’ve described before that CRITTERs can take a bit more patience with application but they are always worth a little extra time in my opinion. This one however was delightful and was opaque with good glitter spread in just two coats. I *did* flip my bottle over for awhile to give some of the bigger glitters a chance to re-percolate the rest of the bottle but that’s pretty par for the course with larger glitters! Get ready for all the stalker links you will ever need to start amassing your own Dollish Polish collection (which I highly recommend). You can find Dollish Polish on Facebook and Instagram. You can purchase your own Dollish Polish at their site and also on Llarowe where there is an exclusive collection. Also I would be HIGHLY remiss if I didn’t mention that Dollish Polish has teamed up with Jindie Nails for some amazing famous couples through history collaboration duos that are limited edition each month. Seriously they have been just awesome so far and I can’t wait to see what they get up to for the rest of the year! 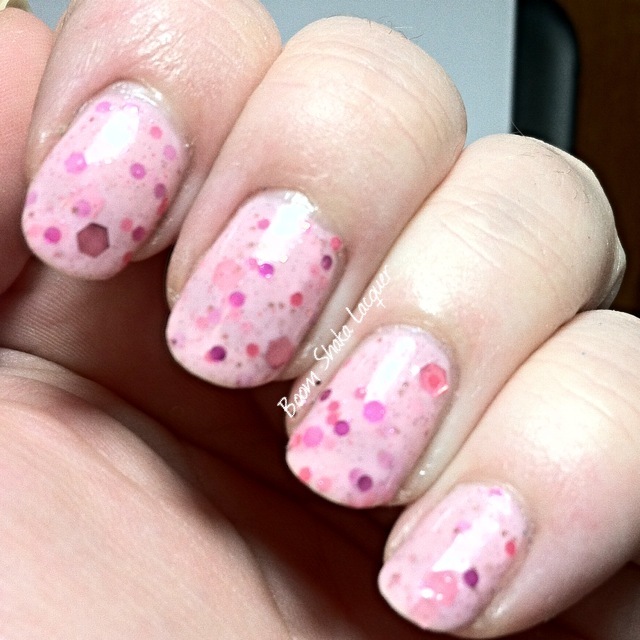 This entry was posted on June 4, 2014, in Dollish Polish, Indie Polish, Wednesdays We Wear Pink.